Shirts With Random Triangles: Auburn receives 15th class of 2015 commitment from Florida high school fullback Chandler Cox. 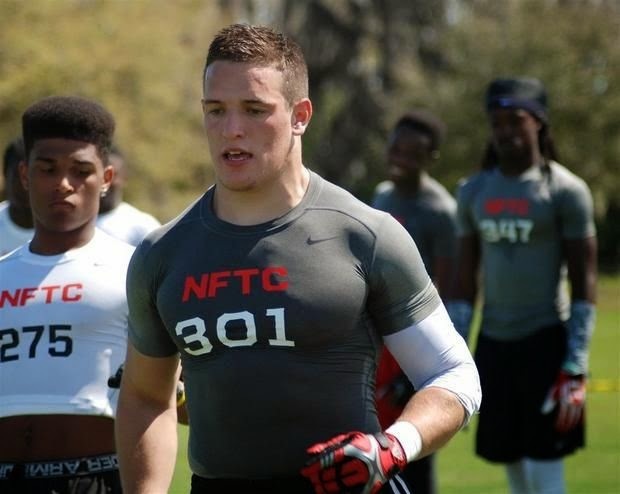 Auburn receives 15th class of 2015 commitment from Florida high school fullback Chandler Cox. Chandler Cox. Photo via al.com. Auburn held its Big Cat Weekend for visiting recruiting candidates over the weekend. The big recruiting news, however came from someone who wasn't in attendance. Apopka, Fl. high school rising senior fullback Chandler Cox announced his decision to commit to the Tigers' 2015 recruiting class on Saturday via Twitter. Cox attends Apopka High School in Apopka, Fl. Rivals.com grades him as a three star fullback, and ranks him as the second best fullback in the U.S.He is 6'2" tall, and weighs 220 pounds. Cox is the 15th member of Auburn's 2015 recruiting class.